Paulist Fr. Rich Andre preached this homily on the 5th Sunday of Ordinary Time (Year C) on February 10, 2019, at St. Austin Parish in Austin, TX. The homily is based on the day’s readings: Isaiah 6:1-2a, 3-8; Psalm 138; 1 Corinthians 15:1-11; and Luke 5:1-11. In every reading today, someone is called by God to do great things, and that person insists that he or she is unable to do what God has asked. But God apparently decides in each case that these people are indeed able to do what God intended. Peter is the rock of the Church, even though he is a sinful man. Paul is the apostle to the Gentiles, even after a history of persecuting Jews. Isaiah is the great prophet of God, even though he has unclean lips. The psalmist is sure that God will complete the great work begun in him or her. Why should we think God would do anything less with any of us? Let us ask the Holy Spirit to reveal God’s love and mercy! Lord Jesus, you are the Word of God living among us. Lord, have mercy. Christ Jesus, you died for our salvation. Christ, have mercy. Lord Jesus, you invite each of us to follow you. Lord, have mercy. Seventeen years ago, my friend Pauline published a wonderful fantasy novel called The Eye of Night. The novel opens as the narrator, Jereth, is having a crisis of faith. He has no family, no money. He’s a priest who questions his god, one of the four gods of his world. In desperation, he makes a pilgrimage to a mystical pool. Many pilgrims have looked into this pool and seen something that changed their lives: soldiers give up their swords; merchants give away their fortunes; children instantly grow wise. But when Jereth looks into the pool, he sees nothing, not even his reflection. This deepens his crisis of identity. What is he to do with his life? Is he to return to his religious order? Or is he to leave it forever and forge a different kind of life? Throughout our lives, we face tough decisions. And sometimes, we don’t even know what the choices are before us. We may have ideas about what we’re doing regarding education, career, relationships, family, social activities, and service, but there will be moments when the way forward is not clear. Sometimes, it’s a question of deciding to forsake all the obvious options and to go in a completely different direction. We are like Jereth, devotedly asking God for direction, and it seems as if God doesn’t answer. What was Peter thinking when Jesus told him to “put out into deep water”? 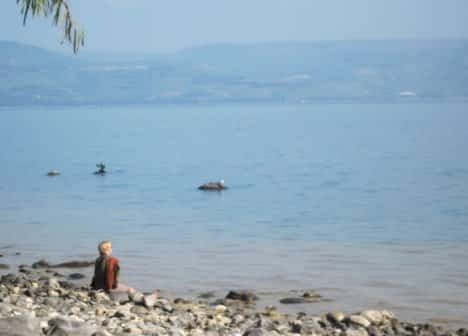 Peter was a fisherman, and Jesus – someone who was not a fisherman – was telling him to trust that where there was nothing to be seen, there was abundance, teeming with life. Peter thought he was just humoring a new-found friend, and yet this moment changed his life. In fact, it changed the world! No one’s life story has a predictable arc. None of us think that we are worthy to follow through on God’s call. Isaiah didn’t feel that he had the ability to proclaim God’s message. Peter had no training as a preacher, and he exclaimed to Jesus, “I am a sinful man.” Paul was killing Christians when Jesus spoke to him. Me? I’d rather not give you the whole litany of reasons why I shouldn’t be a priest! At this moment in your life, how is God calling you into a deeper relationship with him? Does the depth of the water scare you because it’s cold, or dark, or unfamiliar? Does the water excite you with the potential of adventure and refeshment? Do you worry that your burdens will prevent you from coming back up for air? My friend Pauline, who wrote the novel I mentioned, has stared into the blank pool herself a few times, wondering what comes next. As someone with a Ph.D. in Old English literature, such as Beowulf, she’s changed directions in her life several times, but it seems to be working out well. Now, as a mother and a professional grant writer, she writes the most wonderful annual Christmas newsletter of anyone I know. And what of Jereth, the character from Pauline’s novel, who sees nothing in the pool? Desperate for purpose and with no place to go, he chooses to protect two other vagabonds on their travels. Even though they don’t know what they are doing, the three of them put one foot in front of the other each day, and follow the premonitions revealed by their gods. And eventually, they save the world, and Jereth and Trenara come to be seen by many as representatives of two of the four gods. Jereth comes to realize that what he saw in the pool was accurate – the gods of the world have destined him to be a person who calls others to greatness. And that’s our job as Christians, too. We put one foot in front of the other. We continue to discern the will of God. We call others to greatness, so that Jesus Christ can continue his work of saving the world.